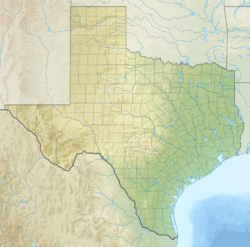 Garland is a city in the U.S. state of Texas. It is located northeast of Dallas and is a part of the Dallas–Fort Worth metroplex. It is located almost entirely within Dallas County, except a small portion located in Collin and Rockwall counties. As of the 2010 census, the city had a population of 226,876, making it the 87th-most populous city in the United States of America and the 12th-most populous city in the state of Texas. In 2017, the population rose to 238,002. Garland is second only to the City of Dallas in Dallas County by population and has easy access to downtown Dallas via public transportation including two Dart Blue line stations and buses. Top to bottom, left to right: Firewheel Town Center, Bass Pro Shops at Harbor Point, Lake Ray Hubbard, Downtown Garland Dart Station, Firewheel Golf Park, and the Granville Arts Center. State St and 5th Street in Downtown during the holidays. On May 9, 1927, a devastating F4 tornado struck the town and killed 15 people, including the former mayor, S. E. Nicholson. Businesses began to move back into the area in the late 1930s. The Craddock food company and later the Byer-Rolnick hat factory (now owned by Resistol) moved into the area. In 1937, KRLD, a major Dallas radio station, built its radio antenna tower in Garland, and it is operational to this day. During World War II, several aircraft plants were operated in the area, and the Kraft Foods company purchased a vacant one after the war for its own use. By 1950, the population of Garland exceeded 10,000 people. From 1950 to 1954, though, the Dallas/Garland area suffered from a serious and extended drought, so to supplement the water provided by wells, Garland began using the water from the nearby Lake Lavon. The suburban population boom that the whole country experienced after World War II also reached Garland by 1960, when the population nearly quadrupled from the 1950 figure to about 38,500. By 1970, the population had doubled to about 81,500. By 1980, the population reached 138,850. Charles R. Matthews served as mayor in the 1980s; he was later a member of the elected Texas Railroad Commission. In the 2000s, Garland added several notable developments, mostly in the northern portion of the city. Hawaiian Falls waterpark opened in 2003. (Garland formerly had a Wet 'n Wild waterpark, which closed in 1993). The Garland Independent School District's Curtis Culwell Center (formerly called the Special Events Center), an arena and conference facility, opened in 2005. Later that year, Firewheel Town Center, a Main Street-style outdoor mall, owned by Simon Property Group, opened in October 2005. It has over 100 business and includes an AMC theater. In 2009, the city, in conjunction with the developer Trammell Crow Company, finished a public/private partnership to develop the old parking lot (the land between 5th Street, 6th Street, and on the north side of Austin Street) into a new mixed-use, transit-oriented development named 5th Street Crossing. Catercorner to both City Hall and the downtown DART Rail station, the project consists of 189 residential apartment units, 11,000 square feet (1,000 m2) of flex retail, and six live-work units. The southeast side of Garland suffered a major blow on the night of December 26, 2015 after a large EF4 tornado struck the area, moving north from Sunnyvale. At least eight fatalities were confirmed in the city from this event. Garland is located at 32°54′26″N 96°38′7″W﻿ / ﻿32.90722°N 96.63528°W﻿ / 32.90722; -96.63528 (32.907325, -96.635197). 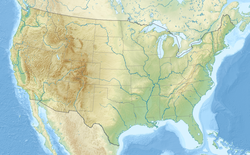 According to the United States Census Bureau, the city has a total area of 57.1 square miles (147.9 km²), all land. In the late 1930s, the Craddock food company, which manufactured pickles, moved to town. In 1937, the KRLD (Dallas) radio tower was constructed in Garland. During World War II, several aircraft plants operated in the Garland area. After the war, Kraft Foods bought the Continental Motors Plant to retool for its manufacture. The Kraft Foods plant still operates to this day. As a station on two railroads, Garland was a major onion-shipping point in the 1940s. In the early 1980s, Garland had one of the lowest poverty rates of cities in the country. In 1990, it had a population of 180,650 and 2,227 businesses, making it Dallas County's second-largest city and the tenth-largest in the state. Today, Garland had a variety of industries, including electronics, steel fabrication, oilfield equipment, aluminum die casting, hat manufacture, dairy products, and food processors. Since 2015, Garland has become one of the largest data center destinations in the metroplex. Over 2,800,000 square feet of data center space is under construction valued at $3 billion in a two block radius. Companies with Corporate or Global Headquarters: Massimo Motors, KARLEE, El Rancho Supermarket, Micropac Industries Garrett Metal Detectors, Resistol, Epiroc Drilling Solutions and 1000Bulbs.com. Companies with North American Headquarters in Garland include: Atlas Copco, Nutri Biotech, and Cake Craft. On May 9, 1927, a tornado destroyed much of the city and killed 17 people, including a former mayor, S. E. Nicholson. Six years later, the Nicholson Memorial Library opened in his honor. The Nicholson Memorial Library System is also the Major Resource Center, or headquarters, of the Northeast Texas Library System (NETLS). NETLS serves a 33-county area that includes 105 member libraries. The NETLS headquarters and offices have been housed in NMLS' Central Library since 1983. Garland includes over 2,880 acres (1,170 ha) of park land, six recreation centers, and 63 parks. An article by Richland College states that, "Richland College officially opened its Garland Campus on June 30, 2009. The campus, located on the corner of Walnut and Glenbrook, serves as a location for area companies, organizations, and individuals. Currently, the campus offers courses and training for Management Skills, Business Productivity Skills, Language Training, Manufacturing/Construction Skills, and Computer/IT Training. This remote campus also provides a separate lease space currently used by the Garland Chamber of Commerce." The city of Garland has a lower than average percentage of households without a car. In 2015, 4.6 percent of Garland households lacked a car, and that figure was virtually unchanged in 2016 (4.4 percent). The national average was 8.7 percent in 2016. Garland averaged 2.04 cars per household in 2016, compared to a national average of 1.8. According to the American Community Survey for 2016 (5-year average), 78.8 percent of Garland residents commuted by driving alone, 13.1 carpooled, 2.5 used public transportation, and .9 percent walked. About 1.3 percent of Garland residents commuted to work by bicycle, taxi, motorcycle, or some other means, while 3.5 percent worked out of the home. The city of Garland owns the Garland/DFW Heloplex. The facility was the first municipal heliport in Texas when it opened in November 1989. Located at 2559 S. Jupiter Road, the heliport is operated by SKY Helicopters Inc., which was initially awarded a lease of the facility in January 1993. The city of Garland operates the city's water system and waste services. Electricity for about 85% of Garland is provided by the city's municipal utility, Garland Power and Light (GP&L). Electricity for the other 15% was formerly provided by TXU, but is now supplied by multiple companies after deregulation of the Texas electricity market. Garland is an original member city of the North Texas Municipal Water District (NTMWD). The vision of the city fathers in the early 1940s resulted in Garland and its companion member cities benefitting from reliable, high quality, affordable water from the water district's many reservoirs. Garland Power and Light has three gas-fired generating plants, which combined have 640 megawatts of generation capacity. In addition, Garland partners with the Texas Municipal Power Agency which operates the 462-megawatt coal-fired Gibbons Creek Power Plant. Garland's electric distribution system has 1,007 mi (1,621 km) of overhead lines and 1,000 mi (1,600 km) of underground lines. Its transmission system consists of 23 substations and 133 mi (214 km) of transmission lines. Garland's peak load for 2007 was 483 megawatts, with annual operating revenues of nearly $238 million. The two national indices are System Average Interruption Frequency Index SAIFI and System Average Interruption Duration Index SAIDI. SAIFI is the number of times power is lost, and SAIDI is the length of time the power is out. These standards compare the frequency and duration of power outages and the customers affected. Garland is one of the few power providers that post their SAIDA/SAIFI numbers. Crystal Bernard, starred as K.C. Cunningham on the TV sitcom Happy Days and as Helen in the show Wings. C.L. Bryant, an African-American Baptist minister and conservative talk show host over KEEL in his native Shreveport, Louisiana, headed the NAACP when he formerly resided in Garland. Amber Dotson, American country music artist. Mitchell Musso, an R&B and Pop singer, songwriter, rapper, and musician, and actor, who grew up in Garland and later became a part of the famous television show Hannah Montana. LeAnn Rimes, two-time Grammy award-winning country singer moved to Garland with her family when she was six. Arnie States, the well-known morning talk show host of The Rob, Arnie, and Dawn Show Also inducted into the Nevada Broadcasting Hall of Fame in 2016. And is a Garland native. Gene Summers, Rockabilly Hall of Fame inductee. ^ "City of Garland Texas". City of Garland Texas. Retrieved October 19, 2012. ^ a b c d e f g h "Garland, TX". Texas State Historical Association. Retrieved January 8, 2012. ^ "Population of Texas Cities and Towns Sorted by County". The County Information Project Texas Association of Counties. Retrieved March 16, 2015. ^ "Best Cities for Working Parents". Nerdwallet.com. Retrieved July 15, 2015. ^ "The 10 Best Cities For Saving Money". Business Insider. Retrieved June 8, 2016. ^ "2015's Best and Worst Cities for First-Time Home Buyers". WalletHub. Retrieved September 23, 2015. ^ "2015's Best & Worst Run Cities in America". WalletHub. Retrieved August 15, 2015. ^ "2016's Best Cities in America for Raising a Family - Move.org". Move.org. August 15, 2016. Retrieved August 27, 2017. ^ Bernardo, Richie. "2017's Best & Worst Cities for Jobs". Wallethub.com. Retrieved August 27, 2017. ^ "The Best Cities for Living the American Dream". Smartasset.com. Retrieved May 22, 2017. ^ "2018's Best Places to Find a Job". Wallethub. Retrieved January 5, 2018. ^ "A Brief History of Garland". City of Garland-. Retrieved January 8, 2012. ^ Grazulis, Thomas P. (1993). Significant Tornadoes 1680-1991: A Chronology and Analysis of Events. St. Johnsbury, Vermont: Environmental Films. pp. 808–811. ISBN 1-879362-03-1. ^ "Curtis Culwell Center". specialeventscenter.com. Retrieved May 4, 2015. ^ "JHP - Architecture & Urban Design" (PDF). Jhparch.com. Retrieved August 27, 2017. ^ "Texas under siege: Tornadoes, flooding, snow and ice". USAToday. Retrieved December 27, 2015. ^ "Garland Texas - News Details". Garlandtx.gov. Retrieved November 13, 2016. ^ "2017 Population Estimates". Retrieved July 19, 2018. ^ a b c "Profile of General Population and Housing Characteristics: 2010 Demographic Profile Data (DP-1): Garland city, Texas". U.S. Census Bureau, American Factfinder. Archived from the original on September 11, 2013. Retrieved January 12, 2012. ^ "Garland (city), Texas". State & County QuickFacts. U.S. Census Bureau. ^ "DP03: Selected Economic Characteristics, 2007-2011 American Community Survey 5-Year Estimates". U.S. Census Bureau, American Factfinder. Archived from the original on September 11, 2013. Retrieved June 24, 2013. ^ Brettell, Caroline B. '"Big D" Incorporating New Immigrants in a Sunbelt Suburban Metropolis' (Chapter 3). In: Singer, Audrey, Susan Wiley Hardwick, and Caroline Brettell. Twenty-First Century Gateways: Immigrant Incorporation in Suburban America (James A. Johnson metro series). Brookings Institution Press, 2009. ISBN 0815779283, 9780815779285. Start p. 53. CITED: p.62. ^ "Texas Primer: The Resistol Hat". Texas Monthly. Retrieved December 25, 2011. ^ a b "Resistol Hat History". Resistol Hats. Retrieved December 25, 2011. ^ "Major Employers & Clusters - Garland Texas Economic Development Partnership - Garland Economic Development Partnership". Garlandedp.com. Retrieved December 4, 2017. ^ "Mapei. Crescita premiata". La Chimica & L'Industria (in Italian). Società Chimica Italiana (9): 12. November 2009. ^ i3dthemes.com. "Nickelrama Arcade, Our games use real nickels". Nickelrama.com. Retrieved August 27, 2017. ^ "Garland Landmark Society - Home". Garlandhistorical.org. Retrieved August 27, 2017. ^ "HugeDomains.com - GarlandDowntown.com is for sale (Garland Downtown)". Garlanddowntown.com. Retrieved August 27, 2017. ^ "History of Nicholson Memorial Library System". Nicholson Memorial Library System-. Retrieved January 8, 2012. ^ "Parks". Garland Parks-. Retrieved January 8, 2012. ^ "Recreation Centers". Garland Parks-. Retrieved January 8, 2012. ^ "Composition of the Garland City Council from the City's Incorporation in 1891 to Present". Garland Landmark Society. Retrieved April 8, 2017. ^ "Mayor". City of Garland. Archived from the original on August 29, 2012. ^ "Mayor". City of Garland. Retrieved April 7, 2017. ^ "Clinic Sites and Services:" Parkland Health & Hospital System. Retrieved on October 25, 2012. ^ "Regional Contact Information" (Archive). Texas Department of Public Safety. Retrieved on April 24, 2014. ^ "Parole Division Region II Archived August 20, 2011, at the Wayback Machine." Texas Department of Criminal Justice. Retrieved on May 15, 2010. ^ "Post Office Location - GARLAND." United States Postal Service. Retrieved on May 16, 2010. ^ "Post Office Location - KINGSLEY." United States Postal Service. Retrieved on May 16, 2010. ^ "Post Office Location - NORTH GARLAND." United States Postal Service. Retrieved on May 16, 2010. ^ "2006 AD VALOREM TAX RATES FOR DALLAS COUNTY" (PDF). Dallascad.org. Retrieved August 27, 2017. ^ "About the Garland Campus". Richland College. Retrieved December 25, 2011. ^ FAA Airport Master Record for T57 (Form 5010 PDF). Federal Aviation Administration. Effective March 3, 2015. ^ Richter, Marice (December 10, 1989). "Garland awaits day heliport will take off". The Dallas Morning News. Dallas, Texas. Retrieved March 18, 2015. ^ "SKY Helicopters - Facilities". SKY Helicopters. Retrieved March 18, 2015. ^ Boehm, Rachel (January 7, 1993). "Garland approves lease for heliport - Carrollton firm signs 5-year deal". The Dallas Morning News. Dallas, Texas. Retrieved March 18, 2015. ^ "Welcome To Garland Power & Light". garlandpower-light.org. Retrieved May 4, 2015. ^ "RAB Hall of Fame: Gene Summers". rockabillyhall.com. Retrieved May 4, 2015.